Situated within the sought-after Imperial Wharf development, this spacious two bedroom apartment features excellent entertaining space with a large private balcony and river views. The development benefits from a range of local amenities while King's Road and Fulham Broadway are also close by. Gorgeous local sourdough bakery that makes amazing coffees and fry ups - even homemade baked beans and perfect poached eggs! 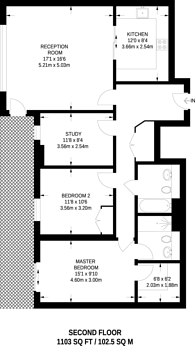 1,103 (102 Sq M) approx.